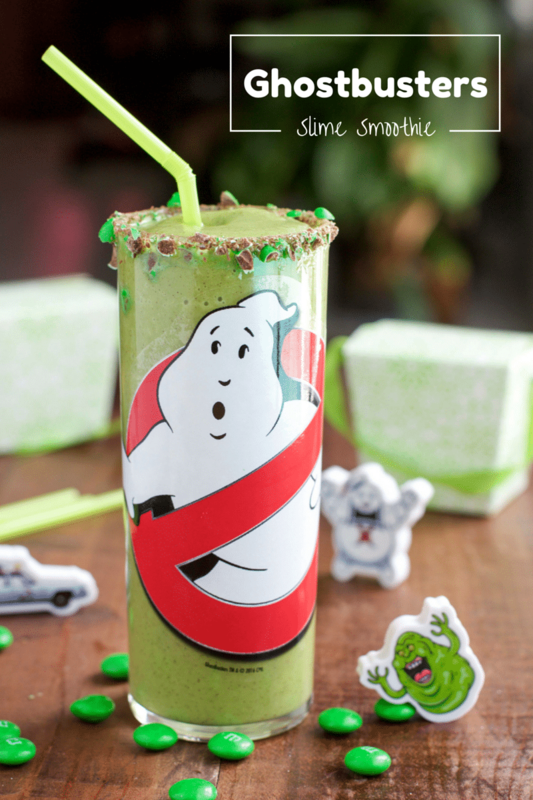 A green Ghostbusters slime smoothie with a crushed M&M’s® milk chocolate rim will delight any Ghostbuster fan! I recently watched the original Ghostbusters for the first time! I know, I know. Where have I been? I don’t know, I guess living under a rock. I’ve been seeing all the previews for the new Ghostbusters and I had to watch the original before we go see the new one! I love Melissa McCarthy, she’s hilarious. I used to watch her on Gilmore Girls when she played the role of Sooki St. James! So I know the new Ghostbusters is going to be awesome too. Plus, Travis is a huge Ghostbusters fan. I mean, massive. He even informed me that he even had a Ghostbusters themed birthday party when he was little. So he was very excited to have a Travis movie night, which meant he got to “choose” the movie from his childhood that we watched. Even though I wanted to watch it, I let him think he picked it so I get to pick the next movie too!